Home » Association News » Saved yesterday…..the lucky ones! Yesterday we attended the St Yrieix Horse Fair in the Dordogne. There were some very sad cases at this years event and many of the equines were clearly not fit enough to be in this sort of enviroment.Here are our findings from the day and our latest little rescues…..
http://www.viande-chevaline.fr/francais/production/index.html and explains about where their horsemeat is sourced, and the horses raised and bred for meat. It makes for interesting reading, and the fact of being pretty much the only way of preserving these heavy horse breeds by eating them is sadly true. The meat seems expensive in comparison with the equivalent cuts of beef, and it appears every product that is made from pork, lamb or beef, pate de tete, sausages, steaks, chops, black pudding etc is made from horsemeat as well. It does appear to be mostly French horses bred for meat and slaughtered in France. The sale is a strange mixture of horses, ponies and donkeys for sale, and a handful of stallions being shown off. One in particular, a beautiful black Friesian, was quite content to be there, though how the owner wasn’t worried about him picking up all sorts from the sick and ill creatures around him is a mystery. There was a lovely big SF 3yo mare, clean limbed and well made, and they wanted 3000 euros for her. She looked in no danger, and was just there on the off chance of finding a buyer, I think. Two gorgeous big Comtois horses stood together surveying the sale, with beautiful big golden eyes. 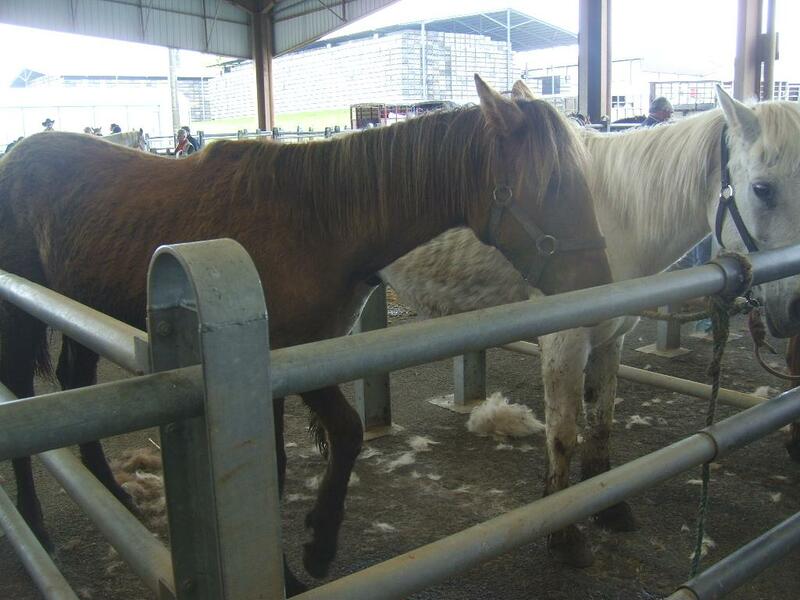 They looked calm and well, but there is no real market for rehoming these horses, at least in France. I just hope the seller took them home, and they didn’t end up with the meat man. One of the dealers with horses in better condition had Spanish and Lusitano horses he had brought up from Spain. They were fairly rough looking, but in reasonable condition. He wanted a lot of money for them, so they at least were in no danger of being shipped off to the butcher. Other than these, the majority of horses were very poor and several looked on their last legs. One particular dealer was responsible for the three worst ones. An aged grey pony, with a barking cough and a nose caked in old and viscous fresh mucus was tied in a pen with a young appaloosa that was so weak it kept trying to lie down on the concrete. It was also coughing, but not as sick as the grey pony. He was asking for 800 euros each, which is ridiculous. He said it could be ridden, and put his child on it’s back, and the poor creature staggered, even with the weight of a child. I was less than polite and told him it was very ill, and far too thin. He assured us they were wormed, which I believe to be totally untrue, as the dung was that soupy yellow way, indicative of worm infestation and lack of food and grazing. Next to them was an equally thin bay horse roughly 3 years old, which stood and shook the whole time we were there. We asked the price and he told us 1500 euros. Both the bay and the appaloosa had infected wounds on their nearside fetlocks, with both front and hind limbs swollen, probably due to how they were transported. 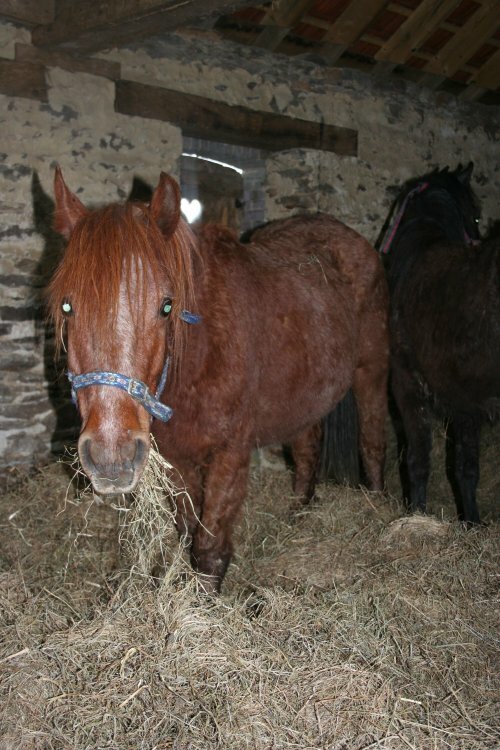 He was also responsible for some pregnant mares, one of which was fully bagged up, and due to foal imminently. The other two were both within days of foaling, I think. 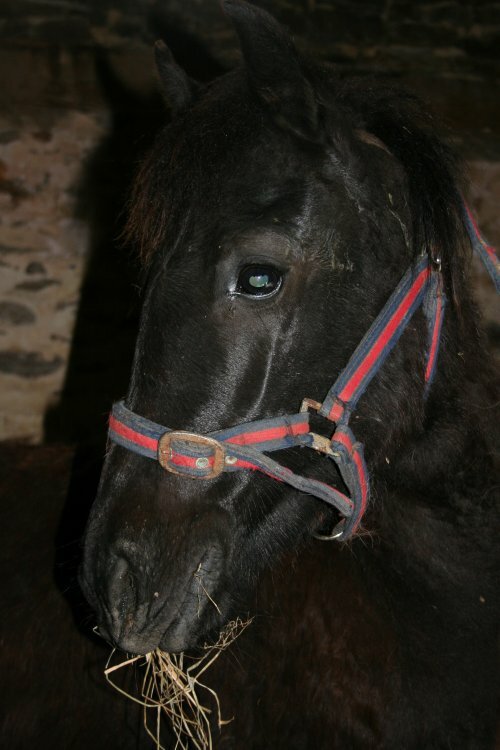 We asked the price of the little black and white mare that was due to foal and was told he wanted 1000 euros. Again, a ridiculous price, but she was a heavy pony, so her meat value would have been higher.. We then returned to ask the price of another, and were told they were all sold. Whether or not he was suspicious of us, I don’t know. Several of the donkeys and ponies looked laminitic, and two or three had feet in very poor condition, with a couple of ponies’ feet starting to curl. We tried to find the owner of a sweet little grey pony that was blind in one eye, and we waited hours for him, and even had the other dealers look for him for us, but to no avail. We had to conclude that he was sold, because that seemed to be the case with the horses and ponies no longer attended. There were several ex-racehorses there, but again the prices asked were too much, around 1600 euros for animals that could be picked up in the UK for £400. It seems to be if they can be ridden, then that is worth a huge leap in price. One dealer was selling a family a pony, and he was leading their child up and down on the pony. On closer inspection, it was actually a foal that the child was on. The family seemed unaware, and the dealer didn’t care. Another dealer had a lot of little ponies, and tried to sell us a grey one that could be ridden, for 800 euros, but again, far too much money. The chances are he would find a home with a child at that price. He also had a couple of yearling mini ponies, and it was horrifying to see him and his kids having a laugh trying to long rein them down the aisles between the pens. They were both very frightened, and kept trying to run away in panic. He also had a little chestnut mare, who looked aged, but turned out be approximately 6 or so. She was in a pen with her dark bay yearling filly, who was already taller than her, but still suckling. Her belly was swollen, but it is hard to say whether or not she is in foal or just wormy at this stage. She was extremely thin under her woolly coat and was her filly who also had a lot of mucus around his nose. These are the two we managed to buy after a whole load of haggling. He wanted to sell the mare only, and the distress to both her and the foal had he managed to do that was unthinkable. The filly would command a higher price for meat because she’s so young, and is the lighter type that the market wants. The mare is very sweet and will make a nice pony for a child, whilst the filly looks as if she could make up into quite a smart little pony. He wanted to sell the mini ponies to us in preference to the mare and filly, I’m unsure whether that was because of the price he’d paid for them, or because he’d get more from the meat man for the mare and filly. The filly is unhandled, and the dealer was really rough at getting her into the lorry with a big rope around her head and neck. Several times she tried to climb out of the pen, but we had to just let him get on with it, as by this stage both ponies were very stressed and the gentle approach would not have worked. 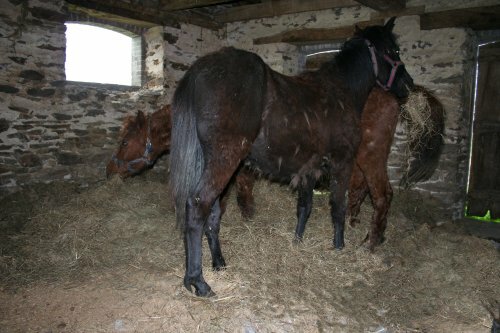 They are now both in a big dry barn, with adlib hay and a bed to lie on, free from any horrors in their future. They were extremely thirsty and hungry when we got them back, they had had no access to water or food all day at the sale. It is going to take patience,TLC and veterinary care to get them into a good state of condition and to trust humans, who have done them so much wrong in the past. Well done! Good luck to you all.I’m sure your rescue horses will give back more than you could imagine. Another wonderful job done by ERF. Super work, I avoided going to the sale, the bank balance would have hit an all time low. Are you gong to need donations for the vets fees? Best wishes, never lose faith and above all keep up the excellent work. Each and every one of those horses must thank you for your presence. Thank you all for your lovely comments. Sorry Karen but someone beat you to the names and they are now called Ruby and Ebony. We’ll keep you updated of their progress on here so you can see how they are doing. Well done ERF – yet again! Thank you for your continuing efforts to save these wonderful creatures. Ruby and Ebony are gorgeous and I look forward to seeing updates about them and following their progress. i had no idea it was like that. i live in uk and have my own trotter know as saz now but he was called fannam du laudot. i believed he raced and the thought of him ever going through anything like that breaks my heart. Hi, possibly i’m being a little bit off topic here, but I was browsing your site and it looks attractive. I’m setting up a blog and trying to make it look clean, but everytime I touch it I mess something up. Did you design the blog yourself? Could someone with little experience do it, and add updates without messing it up? Anyways, good information on here, very useful. Thank you for your comment.Wordpress is very user friendly and most people get to grips with it very quickly. There is also a very useful forum on here that answers most questions.